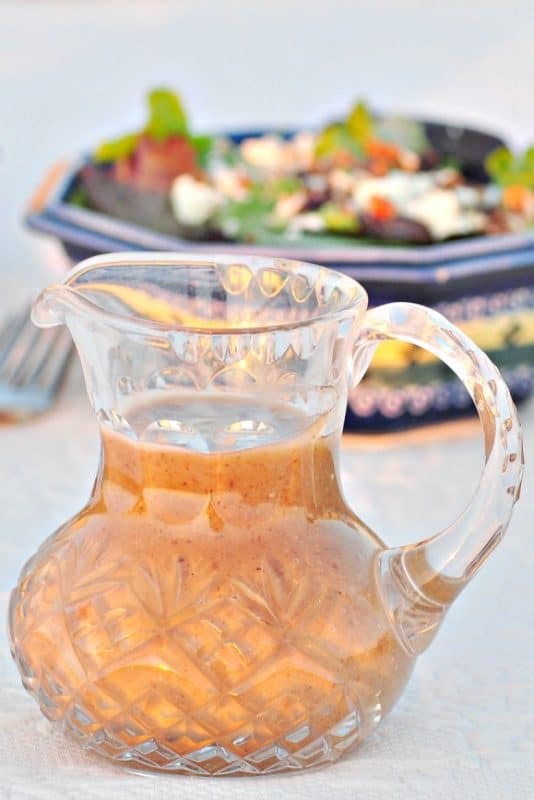 A homemade vinaigrette dressing made with raisins and healthy olive oil. 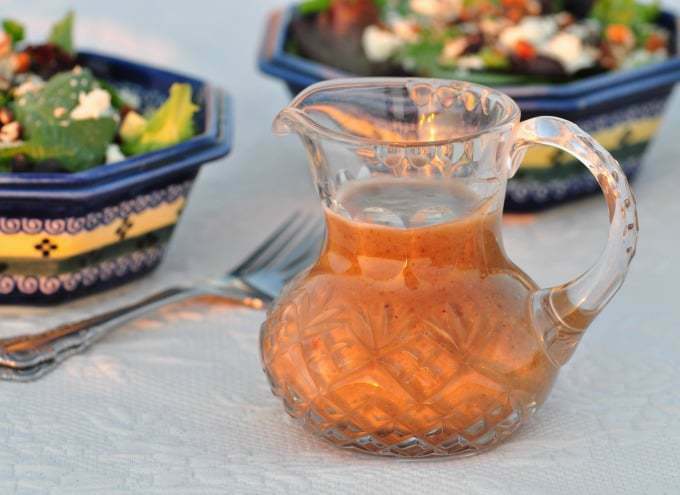 A delicious, flavorful dressing that’s great with salads and grilled meats. Made with simple everyday ingredients it couldn’t be easier. If you remember, I visited my mother in Georgia recently, spending 10 days with her and my sister. While there, we had dinner with one of my nieces who served a delicious salad with a vinaigrette dressing. The raspberry vinaigrette was the highlight of the salad! After returning home, I decided to recreate the salad complete with a vinaigrette dressing as part of a meal. The salad, Toasted Pecan, Feta and Raisin Salad, was easy enough to recreate and with the addition of toasted nuts, it was delicious! But, the vinaigrette was a different story. While shopping for ingredients for the salad, I had a bottle of raspberry vinaigrette dressing in my hand, reading the ingredients list. As much as it pained me, I could not purchase it knowing all the unnecessary ingredients not to mention the unhealthy ones! I found recipes for raspberry vinaigrette using raspberry oil which is available in specialty stores. But, I tend to shy away from recipes in which I must purchase special ingredients to use only for that recipe but, of course, there are exceptions! So, I resigned myself to serving the salad with a plain vinaigrette dressing. But my mind was plagued with the complementary flavors of that dressing – I really thought it made the salad. One afternoon while preparing for the next day’s meals, I had the idea of using raisins to make a Raisin Vinaigrette dressing. After all, I always have raisins on hand so there would be no unusual or exotic ingredients to purchase. I began experimenting. First I microwaved the raisins in vinegar until boiling and then allowed them to cool. Then came the other ingredients and voila – a delicious Raisin vinaigrette dressing. 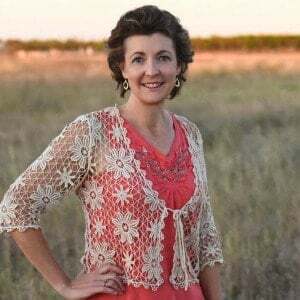 In the Making Homemade Salad Dressing Video, I shared a quote that inspired me to begin making my own homemade salad dressing – “every home should have its own house salad dressing just like fine restaurants”. Raisin Vinaigrette dressing is my new house salad dressing, especially when I serve Toasted Pecan, Feta and Raisin Salad! This Vinaigrette Dressing uses good-for-you olive oil, and is sweetened with honey. Raw sugar or Sucanat could also be used but honey not only gives a balance of flavor but if you use raw honey, you are also getting the beneficial enzymes. It is definitely a salad dressing recipe I will keep on hand! For the Raisin Vinaigrette Salad Dressing, other salad dressings and mayonnaise, I have found the immersion blender purchased from my affiliate partner to be invaluable – Bamix Gastro Professional. A blender or food processor also works but I use the immersion blender for all of them now – the clean-up is just so quick and easy! 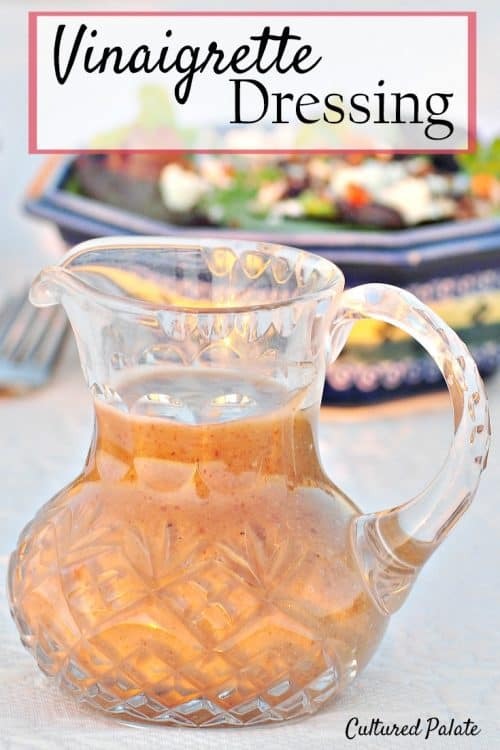 If you’ve tried this Raisin Vinaigrette Dressing or any other recipe on Cultured Palate please take a minute to rate the recipe and leave a comment letting me know how you liked it. I love hearing from you! You can also FOLLOW ME on PINTEREST, FACEBOOK, INSTAGRAM, YouTube and TWITTER. I love making my own salad dressings so I know exactly what ingredients are in them. Combine in microwavable boil the red wine vinegar, raisins, salt and pepper. In a small boiler, combine the red wine vinegar, raisins, salt and pepper. Remove from heat, cover and allow to cool. Add olive oil and honey and blend until smooth. Add water one tablespoon at a time and thin to desired consistency - I used all 6 Tbsp. Pour desired amount over salad and toss. Toasted Pecan, Feta and Raisin Salad is delicious with this dressing! This Vinaigrette Dressing uses good-for-you olive oil, and is sweetened with honey. Raw sugar or Sucanat could also be used. Using an immersion blender for Vinaigrette Dressing, other salad dressings and mayonnaise works very well. But, a blender or food processor also works well. What a lovely sounding dressing, definitely one to try soon! Thanks, Emily, be sure to let me know how you like it!